Digital vacuum gauge for measuring over the 0 to 760 mmHg (millimetres of Mercury) absolute pressure range. 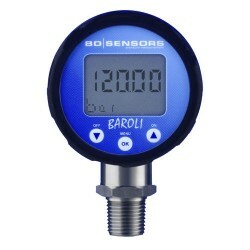 This Baroli pressure gauge will measure positive vacuum pressures from zero absolute pressure to atmospheric pressure. 760mmHg absolute is the universally accepted reference value for atmospheric pressure at sea level. Please complete form below to request a quote for 760mmHg absolute range digital vacuum gauge. Send us your enquiry for 760mmHg absolute range digital vacuum gauge to get assistance with this product type.